To mark the second anniversary of the Mercedes-Benz Driving Academy, 2008 Formula 1 World Champion and Driving Academy ambassador, Lewis Hamilton, will be giving a team talk to learners this summer at an exclusive event on 4 July. Since launching two years ago, Mercedes-Benz Driving Academy has achieved a first time pass rate of 78% - almost double the national average. The Driving Academy aims to teach learners how to drive, not just past their driving test. Each of its 5000 students have been coached by the team that has been trained according to HERMES - the latest EU research standard. This gives dedicated focus so learners can understand for themselves how everything from behaviour behind the wheel and distractions can add to risks on the road. The idea is to enhance an individuals learning experience by giving the ability to understand and find the best way of dealing with road scenarios and developing skills, rather than following a belief of one size fits all. Pre-Road sessions use the unique facilities at Mercedes-Benz World and are tailored for anyone over 15 years old. This provides young drivers with highly valuable experience from day one. By following a special curriculum designed to prepare young for the public roads, the coach ensures that the incredible experience of driving before turning 17 years old is done so to develop the right attitude and safety messages in preparation for the public road. Building on experience is valuable to provisional licence holders. Its simple - the more practice and experience behind the wheel a learner can get between lessons, the more confidence and ability they have to deal with road situations. The Driving Academy have developed the Parent & Partner course to assists learners and the parent or driving partner that accompanies them to enhance the and support the paid for lessons to get maximum value for money. This recognises that learning to drive is an investment and as with any investment it is all about getting the maximum return. Aimed at schools or youth groups, RoadSense has been developed to show that everyone is responsible for road safety, whether a driver, cyclist or pedestrian. The benefits have been proved by from a scientific research that the Driving Academy ran in the Netherlands that showed the programme has a strong and positive influence on behaviour. Attendees to the half day course will also get behind the wheel of a car themselves to fully understand how emotions and distraction heighten the risk on the road, therefore demonstrating the why positive attitudes and behaviours are so important. The success of the Driving Academy means that it continues to grow in the South East with longer term plans to expand to other areas of the country. There is a unique franchisee package available for experienced ADI’s to share the Driving Academy vision of accident free motoring through the latest revolutionary coaching methods in driving tuition. For more information please contact Kate Smith kate.smith@mercedes.co.uk, or call 01932 373936. 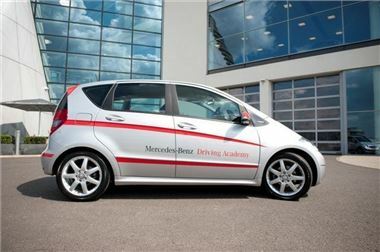 For more information on all courses and special offers available through Mercedes-Benz Driving Academy visit www.mbdrivingacademy.com or call 0845 123 0055.